← Sunday: Newtown Creek Photo BioBlitz! Jamaica Bay Restoration with Hour Children and American Littoral Society! HarborLAB planted thousands upon thousands of saltwater marsh grass seedlings in Jamaica Bay this summer, under the direction of the American Littoral Society. These outings instructed us in how to grow spartina at Newtown Creek, the intertidal zone of the HarborLAB GreenLaunch now in development. We also spread the word, and grow seedlings, through our “Cordgrass in the Classroom” project. Cordgrass (Spartina alterniflora) is a building block of our estuary ecosystem. It shelters invertebrates upon which shorebirds feed. It might also shelter our city from the Anthropocene‘s angrier seas. HarborLAB has given school and library demonstrations and lectures about this important contributor to habitat and resilience. HarborLAB partnered with Google for our first planting, and then returned with GLG and Hour Children, an organization serving children who were born in prison or whose mothers have been incarcerated. Hour Children has also become a neighborhood anchor in the massive public housing row of western Queens. 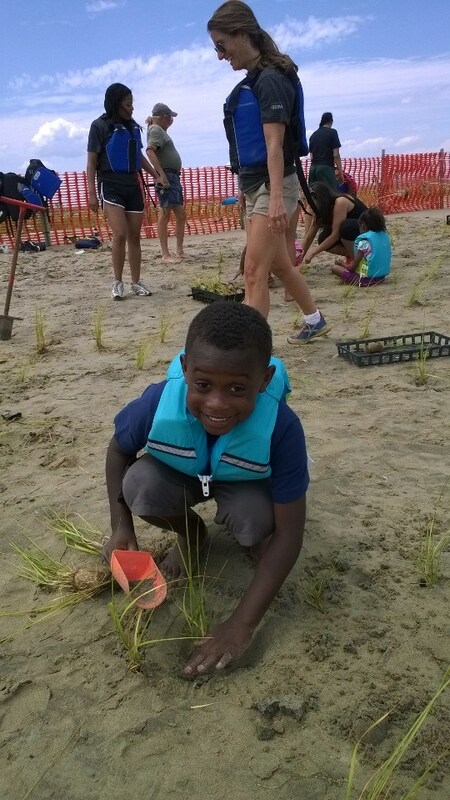 We paired adults with kids to paddle out to sandy island where Don Riepe of the American Littoral Society directed us, with help from the Resiliency Corps and Jamaica Bay Ecowatchers, in planting rows and rows of spartina plugs. Our group of 20 Hour Children participants also enjoyed a Gateway Wildlife Refuge orientation and nature walk with the ALS before planting began.